I finally took the plunge and created a Facebook page for my blog! I’ll alert people on facebook when I post a new blog entry of course, but I also hope to post links, articles, sites, other blogs that I find interesting… All about cooking and eating, of course! Find me on facebook here, and don’t forget to share the page with your friends! Last weekend I bought a couple of big bags of lemons at the markets, with the idea that I would preserve them whole for use in cooking. Well, Mr T and I finally got around to doing this yesterday! Preserved lemons have a wide range of uses in cooking. They can be used in virtually any savoury dish from roasts to stews (not in a dessert though, as they are preserved with salt). They are very common in Moroccan dishes. A great way to jazz up a plain rice side is to saute some onion and garlic, then boil the rice with the onion and garlic plus some currants, cashews and finely chopped preserved lemon. Yummy! 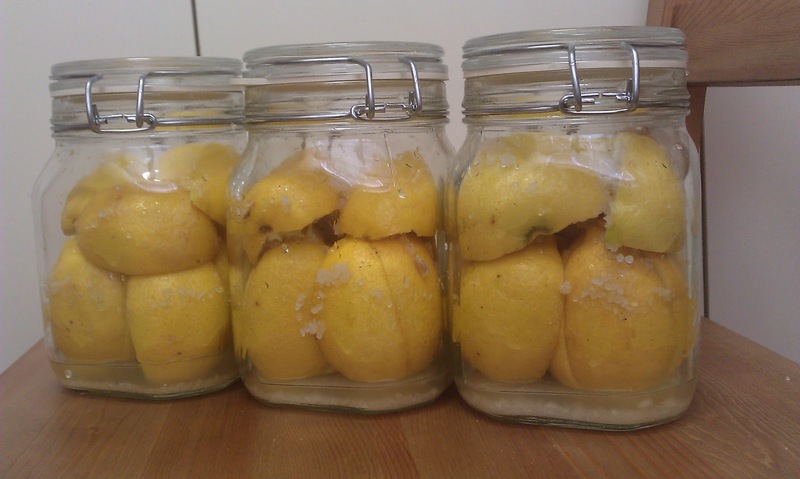 It really is just so easy to preserve lemons (and you don’t even need a thermomix to do it!). Home-preserved lemons are far cheaper too, as with anything you make from scratch. Not to mention healthier! Remember, the best way to know for sure what is in the food that you’re eating is by making it yourself. Note: the following recipe is the quantity per 1L jar. Adjust quantities to suit however many jars you would like to make. The preserved lemons will last six months or more, but can’t be touched for the first 4 weeks while the flavours brew, the rind softens and any nasties are killed by the salt. To use in cooking, cut out the flesh and cut the pith away from the rind – use the rind only. Use sterilised jars. I wash my jars in hot, soapy water and then put them in a 120degree oven until dry. 1) Make sure there are no remnants of the stem still attached to the lemon. 2) Wash the lemons well – a palm-size veggie brush (usually only a few dollars from a kitchenwares store) comes in very handy for this. 3) Dry the lemons completely. 4) Sprinkle 1 tablespoon of salt into the bottom of the jar. 5) On a large dinner plate (preferably one with slightly curved or raised edges – you want to catch all the juice and salt), stand one lemon up with the pointed end (not the stem end) up, and cut down almost all the way to the bottom (do not cut through; stop about a centimetre up from the bottom of the lemon). Rotate the lemon 90 degrees and make another cut, again stopping 1cm from the bottom. Your lemon should be divided into quarters, but not cut all the way through. Pull the lemon open slightly along one cut, and tip half a teaspoon of salt into the slit. Pull the lemon open slightly along the other cut line and tip another half a teaspoon of salt into that slit. Rub the salt evenly into all cut edges and place the lemon in the jar. 6) Repeat with remaining lemons, packing into the jar as tightly as possible. Tip the juices and salt on the plate into the jar, and sprinkle lemons with more salt – a scant tablespoon. Seal jar. 7) Repeat above steps to fill any remaining jars. If doing more than one jar, do not wait until you have finished the last jar to tip all the leftover juices in – tip the juices in after filling each jar, you want all the jars to look the same and have the same amount of liquid/salt in them. 8) Leave in a cupboard for 4 days. The juice will gradually drip out of the lemons, until they are covered. If the lemons are not completely covered by their own juices after 4 days, squeeze some lemon juice from extra lemons into the jar until the lemons are completely covered. 10) Let them brew undisturbed in their jars in the cupboard for 4 weeks. This lets the rind soften, makes sure the salt kills any bugs, and just helps the flavours come along. Each time you remove some preserved lemon, ensure the remaining lemons are still completely covered by the preserving liquid. 11) Find exciting recipes in which to use your preserved lemons! Be brave, and try something new!